So… what do we know about Pierrot? Always found them a bit creepy. And I’m most definitely not one of clown-o-phobic types. Solution to a clue in The Times jumbo crossword involving seaside attractions and cause for its demise. 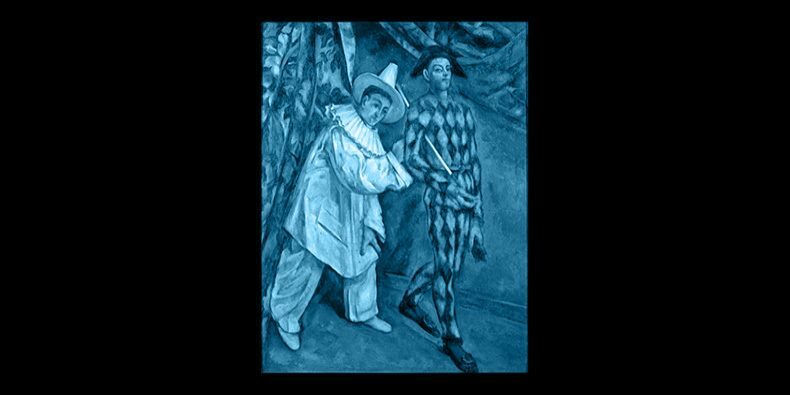 In ‘The English Assassin’ and ‘The Condition of Muzak’ by Michael Moorcock (q v) Jerry Cornelius frequently morphs into the rôle of Pierrot. Placebo (q v) had a song called ‘Pierrot the Clown’ on ‘Meds’. @Dr D – I misread that as “Pierrot the Clown on Meds” which could easily be a song about Bowie. Pierrot symbolises all thats wrong in light entertainment. I would prefer to watch daytime television, such as “When bariatric hoists attack” or watching a live TV debate about at what point savoury jellies become a jam, over seeing a luminous mute Siouxsie and the Banshees Happy House ripoff do ironic shrugs.